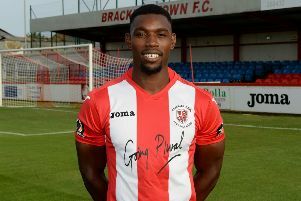 Jimmy Armson struck twice as Brackley Town got back to winning ways in Vanarama National League North. Kevin Wilkin’s side picked up their first victory in eight outings following Tuesday’s 3-1 success at Gloucester City which put an end to the Tigers’ recent winning streak. Two goals from Armson and one from Glenn Walker earned Saints three deserved points at Whaddon Road to send them to York City for Saturday’s Buildbase FA Trophy quarter-final in good heart. City had won four and drawn one of their last five games in contrast to Saints who came into the game searching for a first league win of 2017. Saints remain in 11th place but the win narrows the gap to City to one point but having played two games fewer. In a first half of limited opportunities it took Saints until the second minute of stoppage-time to break the deadlock as Armson was felled in the box to earn a penalty. Armson duly despatched the ensuing spot-kick with a fine strike to Jasbir Singh’s right. The second half opened with a goal flurry as City equalised through substitute Darren Mullings four minutes after the restart who found an improvised finish under pressure. But three minutes later Saints were back in front as Walker scored direct from a free-kick, beating Singh low into the corner. The visitors’ lead was rarely threatened and Armson increased their advantage in the first minute of stoppage-time slotting the ball neatly past Singh.